This is the plant which is the default banner on my website. This first picture looks rather red but the banner is the right colour. Van Houttii appears to be a form of splendens but is probably longer lived. It is quite permanent in a warmish environment. 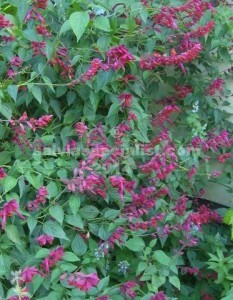 It has marvellous wine coloured flowers that everyone loves and flowers most of the year. 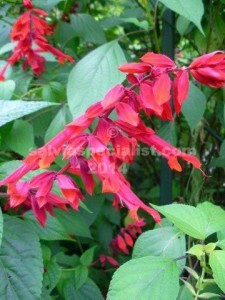 It grows to about 2m x 1m in time and is very useful for part shade. 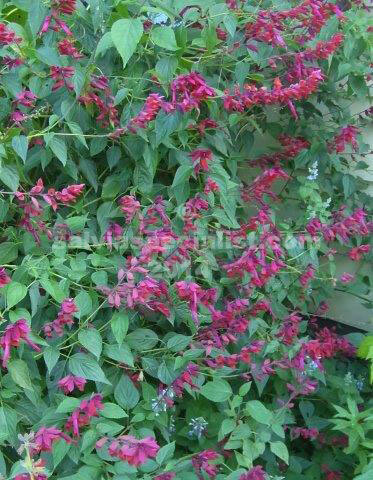 This plant is very well known worldwide and has been sold for a long time. It is not known where it originated. These days and in sub tropical areas of Australia there are a big selection of similar splendens type salvias, some of them get their own name. There are a few variations of the spelling of the name. In Australia there is a very slight variation called ‘Alan’s Maroon’. It is hard to recognise the difference unless you are very familiar with them but I think Alan’s maroon is a bit superior.